To set up a BOLT by Girl Charlee wholesale account please complete the form below. If you currently have an account at Girl Charlee please note that we need a separate account to be created with a different email address than your regular girlcharlee.com email address. Please enter any comments or questions in the message area and we will respond to you as soon as possible. Thank you for your interest in BOLT by Girl Charlee! To learn more about our BOLT fabrics, view our collection look book by clicking the image. 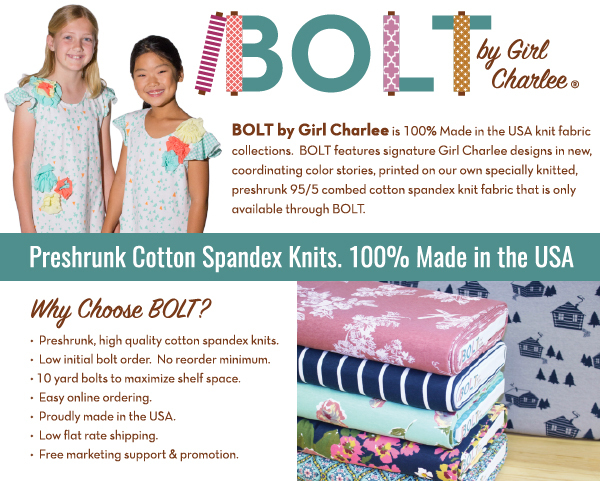 EE Schenck is the exclusive North America distributor for BOLT by Girl Charlee and stocks all current collections. If you have an account with EE Schenck contact your sales representative to learn how to purchase BOLT by Girl Charlee today. Fabco New Zealand is the exclusive New Zealanda distributor for BOLT by Girl Charlee. Fabco has been supplying the New Zealand craft and lifestyle fabric market for over 20 years. Contact Melanie or David to learn how to get BOLT by Girl Charlee in your New Zealand store.